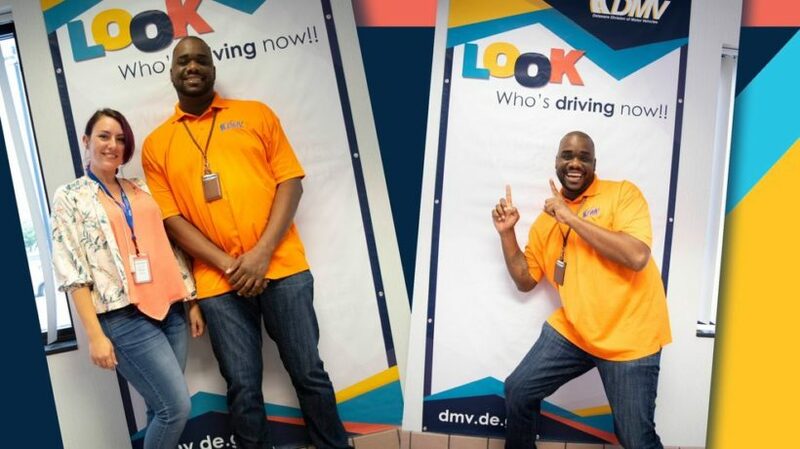 Laura Russum and Willie Goldsboro of Delaware's DMV stand in front of the selfie backdrop they created for new drivers. (Compiled from articles by Hannah Chinn at NBC Philadelphia and the AP) – Delaware’s Division of Motor Vehicles has installed “Safe Selfie Zones” at its four locations, to allow newly licensed drivers to share the news — and not their personal details. WBOC-TV reports that the zones feature a bright backdrop in front of which people can take pictures of themselves to share on social media – instead of sharing photographs of their driver’s licenses. As Mr. Goldsboro congratulated students and handed them their licenses, he grew increasingly concerned with what he saw them doing. U.S. licenses have the driver’s full name, picture, DOB, license number, and address — personal information that, after being posted, could be stolen and used without the owner’s permission. Goldsboro says his father-in-law is a cop and deals with issues like identity theft, so watching kids post this information was a red flag for him. He approached Laura Russum, another DMV employee who coordinates social media and communications, for help. Originally, Russum said, they thought of creating a license prop. When that didn’t fly, they brainstormed ways to cover up identifying information on the new licenses. But that didn’t feel right, either. She designed the signage and wording for the backdrop, plus shareable hashtags to go with it. The resulting project was a hit. On September 17, Delaware’s Division of Motor Vehicles launched “Safe Selfie Zones” at its four locations – so new drivers can collect likes, without compromising privacy. Read the press release at Delaware DMV’s page. Compiled from articles at NBC Philadelphia and AP at ABC6 for educational purposes only. 1. What problem did Willie Goldsboro notice while working at the Delaware DMV? 2. Mr. Goldsboro was motivated to act by his concern for new teen drivers. How did he solve the problem? 3. What is the goal for the new selfie backdrops? 4. What types of information does a drivers license contain? 5. What do you think of Willie Goldsboro and Laura Russum’s solution? 6. The major news articles of the day tell of important happenings. Human interest stories tell of how those happenings have impacted the people or places around the story. These stories take a break from the more serious news material to highlight something light or funny, something unusual and often something inspiring.